We design and offer a mesmerizing collection of decorative tassels that reflect the fine craftsmanship of our adroit craftsmen. 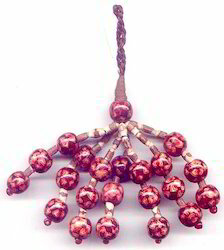 Be it mini tassels, key tassels, beaded tassels, sofa tassels, all these are known for their style and appeal. Available in a wide plethora of colors, sizes and styles, the tassels are sure to add a charming look to home furnishings. Size Tassel 11cms. & Loop 20cms. Size Tassel 7" & Loop 4.75"
*Size Tassel 3.75" & Loop 1.75". 1)Size Tassel 4" & 0.25" Ring. 1)Size Tassel 5" & Loop 4.5". *Size Tassel 6.25" & Loop 4". *Material - Polyester & wood Beads. 1)Size Tassel 5.5" , Hanger 1" & Metal Hook 1.25". *Size Tassel 5" & Hanger 3". 2)crystal Ball 45mm & Loop 12cms. 1)Size Tassel 3.5" & Loop 2.25". *Size Tassel 7" & Loop 1". 1)Size: Tassel 9.5cms. & Loop 6.5cms. 11)Variant color, size and design. 12)Different colors and styles are available. 1)Size Tassel 6" & Hanger 1". *Size Tassel 6" & Hanger 3". 1)Size Tassel 4.25" & Loop 3"
Size Tassel 10cms. & Loop 9.5cms. 1)Size 5" Tassel & Loop 3". 1)Size Tassel 9cms. & Hanger 5.5cms. 6)Size according To customer request. 9)Size could be done as customer's request. 10)Style all according to your requirements. *Size Tassel 10cms. & Loop 5.5cms. *Size Tassel 4.5" & Hanger 2"
1)Size Tassel 4" & Hanger 2". Size Tassel 5" & Loop 7". 1)Size: Tassel 6cms. & Loop 4cms. 1)Size Tassel 3.5" & Loop 3". Size Tassel 9" & Hanger 475"
*Size Tassel 5 " & Hanger 3". 1)Size Tassel 5" & Loop 1.5". *size: Tassel 10.5cms. & Loop 5cms. 1)Size: Tassel 4" & Hanger 2"
7)Lower price compared with others. 1)Size Tassel 4" With wooden Head 1" & Loop 2"
Size: Tassel 9cms. & Loop 5.5cms. 1)Size Tassel 5" & Loop 2". 1)Size Tassel 5" & Hanger3". 1)Size Tassel 5.25" & Loop 4.25". 7)Any size & colour we can make. Size Tassel 10cms. & Loop 4.5cms. *Size Tassel 4" & Loop 2.75". 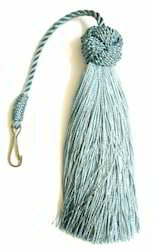 Size Tassel 4.75" & Loop 3"
Size Tassel 4.5" & Hanger 4.5"
Looking for Decorative Tassels ?